Soccer is the word used by people who live in the United States. Futbol is used by everybody else. The game itself is quite simple. You and your team have 90 minutes to score a goal. No hands, except for your goalie but he/she is there to stop the ball from going in. You and your team have to pass the ball to each other in order for someone from your team to score. A total of 11 play at one time, this number includes the goalie. Soccer also includes no timeouts. Your coach can’t call a timeout in the middle of the game to tell you what you’re doing wrong or to give you a quick breather. Nope. He/She has to wait until 45 minutes have gone by and its halftime or the game ends. As for substitutions? Most competitions allow for only three substitutions. 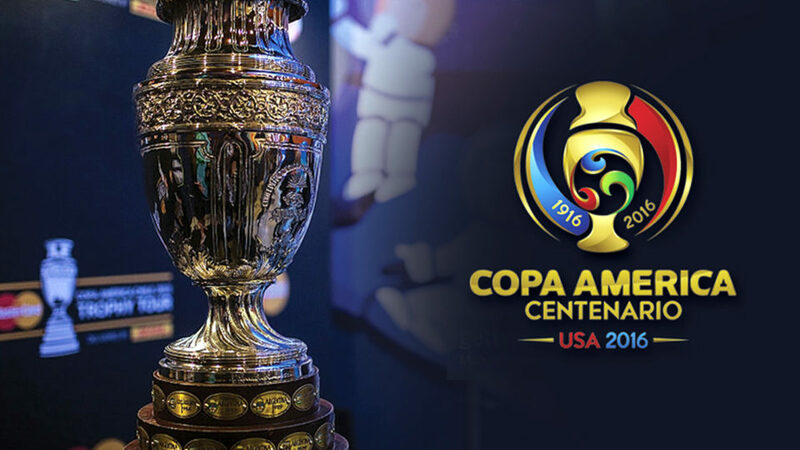 From June 3 until June 26 the Copa America will be taking place. The hosts? The good old USA. (I sadly could not get any tickets for any games). The Copa America brings together every country, who qualifies, that belong in either North, Central, and South America. Due to being hosts, USA automatically qualified. Mexico also automatically qualified. There are a total of 16 teams who will be attempting to win the trophy. You see, like any sport, winning a trophy gives you pride at the fact that the team you supported won. At the international level in soccer it’s more than just team pride. It’s national pride. Nothing feels better than telling people your team is better than theirs. Actually, one thing does and that’s telling people that your national country is better than theirs. No matter the topic. The reason I’m bringing this up is because there is a stereotype that all Latinos are obsessed with soccer. This stereotype is both true and false. While you can find about 30 Latinos sitting around watching a game. You will also find about 30 other Latinos who couldn’t care less. The enjoyment of soccer has nothing to do with race, culture, or family. It has to do with personality. My mother hates when I spend all day watching soccer games but my uncle will be seated right next to me. There are may reasons why some people choose not to watch soccer and the main one is that there are times when neither team is able to score and the game, if it’s not a championship game, will end in a tie. This leads many people to say, “Soccer is boring because sometimes it ends in a tie.” Well yes and no. Matches sometimes do end in ties but that’s not boring. That’s the beauty of it. In basketball, you know that scoring will consistently happen. In soccer, you don’t know. It’s the suspense of knowing that the game could go on for 89 minutes and then someone scores. Your team could lose the game at the very last minute. On the flip side, your team could win at the very last minute. In honor of the 2016 Copa America I wanted to show not only amazing talent done by these soccer players but also the goals in an attempt to convince people to watch the Copa America and cheer on their national side. (Or just pick the team with the hottest players). I will of course be cheering for Mexico and USA. The 2015 Copa America was hosted by Chile. The final came down to Argentina and Chile with the winner of the tournament being Chile due to penalties. Hopefully the host’s winning will be repeated this year. If neither USA or Mexico wins, you will find me crying in the corner. 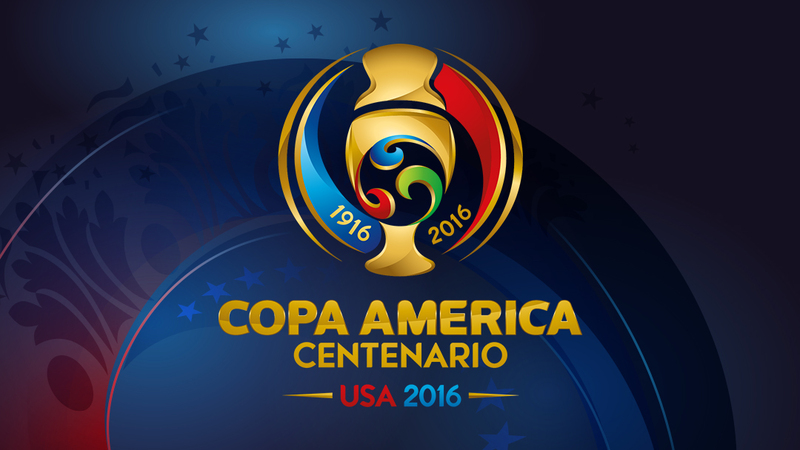 Here’s a video of moments that made up the 2015 Copa America. Some moments are goals and skills and others are fights and arguments. (Which to be honest, are probably my favorite part). As I said before a total of 16 teams will be playing in the tournament. 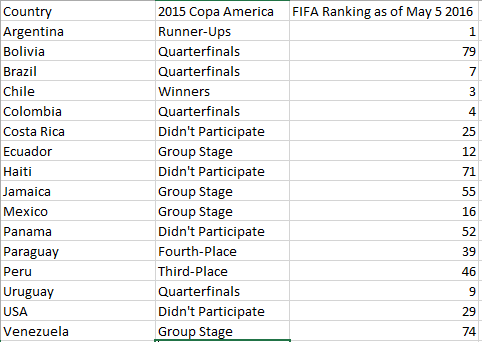 I have decided to include those teams here as well as how they did in the 2015 Copa America and their current FIFA Ranking. From these, you can go to the Copa America website and create a bracket. If you so wish. If you don’t care to watch, that’s fine. You can join my mother in her judgment of me. If you would like to see what the big deal is then I highly recommend you watch. You can watch on ESPN, Fox, find the matches illegally online, find the matches legally online or you can watch on the Spanish channel, Univison. Even if you don’t want to watch the actual game, just listen to the commentary. It’s hilarious. Soccer isn’t something that every single Latino loves and it isn’t a boring sport. I would rather watch a 90 minute scoreless soccer match than a basketball game and basketball is my second favorite sport. Here’s a video of fights that happened in 2015. Because they always make me laugh. Here’s a video of goal celebration fails. Because these always make me laugh. Here’s a video of some goals from 2015. If you don’t want to see all 100, skip to 14:58 to see the top 20. 16:37 to see the top 10 and 17:30 to see the top 5. (Order is subjective). My point is, watch soccer. It’s eventful, suspenseful, blows your mind, and at times, hilarious. Group A: U.S. and Colombia advanced to Quarterfinals. Costa Rica and Paraguay knocked out. 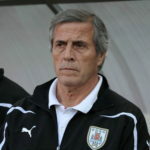 Group B: Peru and Ecuador advanced to Quarterfinals. Brazil and Haiti knocked out. 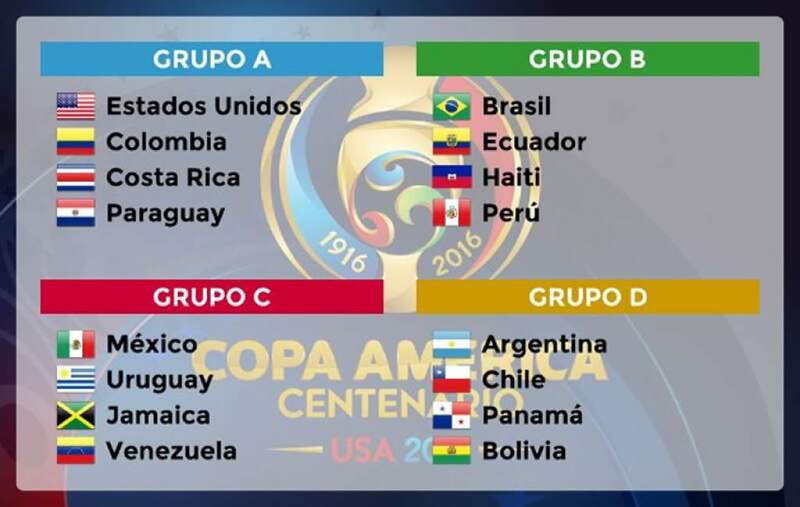 Group C: Current leaders are Mexico and Venezuela. Group D: Current leaders are Argentina with Chile and Panama. Quarterfinals take place June 16,17, and 18. Semifinals take place June 21 and 22. Third place takes place June 25. Final takes place June 26. Click here for easy to read schedule. 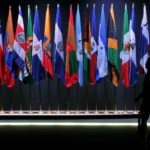 This is the eighth article of the column titled “Living in White America.” Every month there will be a new article discussing how one immigrant group, Latinos, live in America. This column will have articles dealing with anything and everything that concerns Latinos, this could include political and social talks. 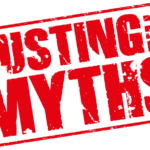 Some articles may discuss a culture of a different Latino group and interviews with a variety of Latinos will be added as well as interviews with non-Latinos asking for their opinion. Discrimination against Latinos has gone on long enough and now it’s time people get a look into a world they dislike so much.